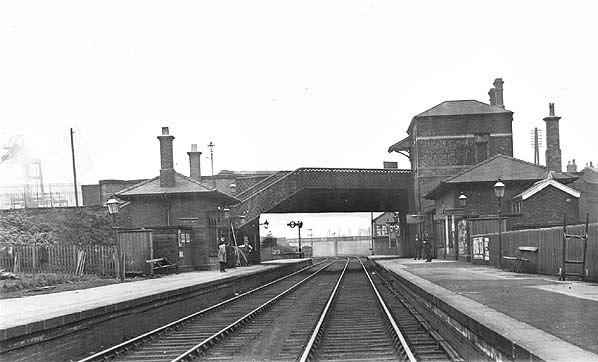 Notes: The station opened as Golbourne Gate and it was situated on what became the West Coast Main Line. The line had more humble beginnings opening on 03.09.1832 as a branch leading from the 1830 Liverpool and Manchester Railway at Parkside and running up to Wigan. Although the line opened in 1932 the station at Golborne probably didn't open till later. Not long after its opening the Station became known simply as Golborne. 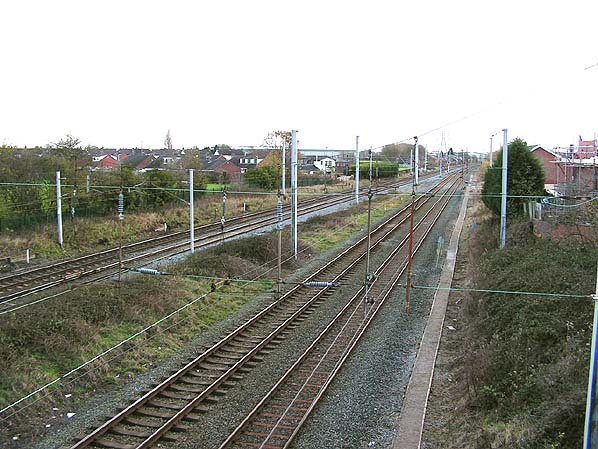 Between 1888 and 1894 the line through Golborne by then part of the LNWR's main line to Scotland was quadrupled but there were only ever platforms on the slow line. On 01.02.1949 after nationalisation the station was renamed Golborne South to distinguish it from its nearby former GCR namesake. Golborne South Station did not survive to the Beeching era closing on 6.2.1961. Goods traffic continued until 22.5.1967. Today bricked up gaps in the road bridge and the track alignment are the only evidence of the stations existence.